The Family Version: In the early 1800s, my grand-father’s ancestors lived in a coastal town called Messolongi, situated on the Gulf of Patra in Greece. In 1820s, during the war of Greek Independence against the Turkish Empire, my great-great-grandfather fled during the Battle of Messolongi into the Mount Parnassus region looking for a safer a place to settle. He came to a village situated on the slopes of Mount Parnassus called Plessas (Πλέσσα) in the Doridos region of Central Greece. He opened a business and eventually was able to buy several homes and shops in the village. What Might Have Really Happened. In the late 1700s, two men named “Kamoutsis” lived in or around Plessas. Where they came from, how long they lived there, and how they were related is unknown. Andreas Kamoutsis was born in 1777 and Stavros Kamoutsis was born 1795. Our family line descends from Andreas Kamoutsis. What We Know Actually Happened. In the early 1900s, two of Andreas Kamoutis great-grandsons – my grand-father (John) and his brother (Peter) emigrated to the USA. We have photos of the Kamuchey family here, including a wedding photo of my Grandfather and Grandmother (John and Erna) and a photo of my Great-uncle Peter. The Kamuchey name is an American construct. 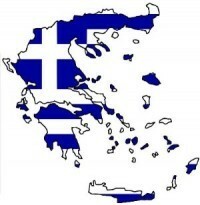 In Greece the name is spelled KAMOYTEHE (ΚΑΜΟΥΤΣΗΣ) and it is pronounced Kamoutsis. Village: The village was recognized as a town in 1912. In the 1920s, the village Plessas was renamed Amygdalia (ΑΜΥΓΔΑΛΙΑ or “Almond Tree”). The name “Plessas” may be based on a Slavic word “Plesso” which means “bald spot” or “area without a forest.” The village is characterized by its beautiful stone houses, the nice doorways, stone walls, narrow roads, the view to the lowlands, which is why the community is considered to still be very “traditional”. 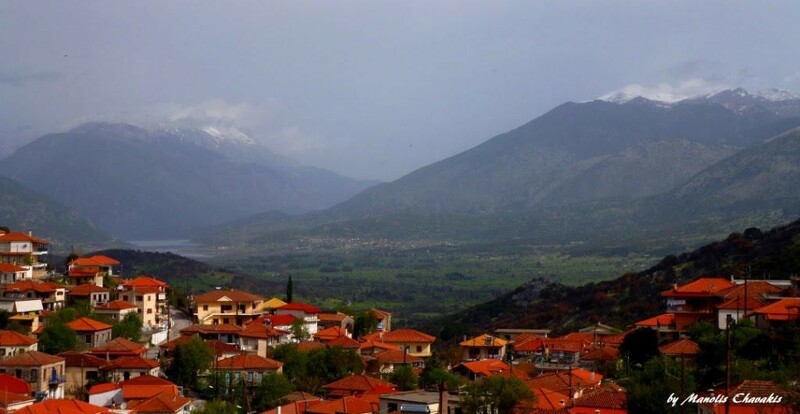 The village is now part of the Fokida or “Phocis” Prefecture (State) and is contained within the Lidoriki Municipality (County). 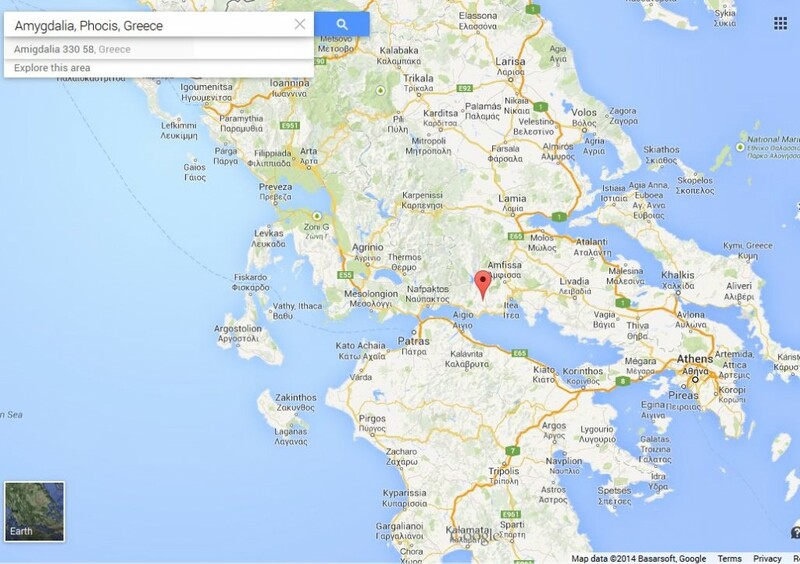 History of the region can be found here, and an overview (translated from Greek) is here. Sample traditional costumes from Central Greece can be found here; ones from the Phocis region are here. 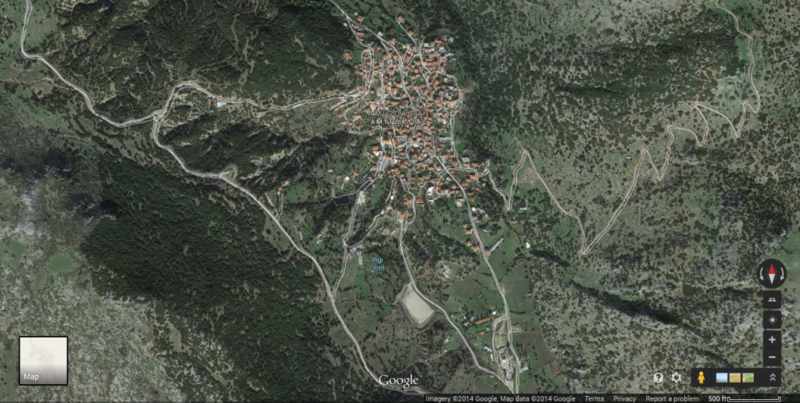 An overview of the village can be found at the Greek version of Wikipedia (link takes you to an automatically translated version of the website). And if you still want more history on the town, here is an archived copy of the town’s website (now offline) (in Greek; you may need to run the page through Google’s automatic translator). One family story is that the Kamoutsis clan once lived in a specific area north of Plessas, between Plessas and the village of Vralia (see the arrow above). The land sits on a flat area beside a river with two nearby valleys. and is known as Vathirema (Βαθύρεμα) which means “Deep River” or “Deep Creek’ (the river dries up in the summer from May to November). The tale says that the Kamoutsis families lived on the land until the time came to select a clan leader. One man was strong but dumb. The other was weak but clever. Because the families could not agree, they scattered and some went to Vralia and others to Plessas and others to the surrounding villages. There are two other towns in the area: Sotena and Malandrino. It is unclear if any Kamoutsis family members moved to those towns.